The snowdrops of February and March are done blooming, but I really must share this picture with you before we say good-bye to this delightful little flower. Snowdrops were always one of my mother's favorite flowers, probably because they were one of the first flowers to bloom in the early spring. When they bloomed at her house, they were always clipped and brought into her house. She collected tiny vases which worked very well for this delicate little flower. Mom also had this sweet little teacup in her collection. Can you see the design? 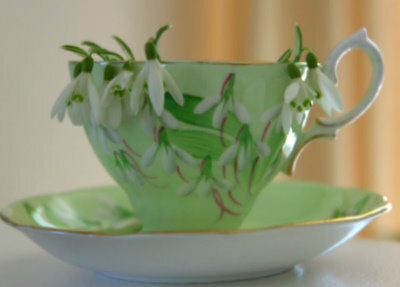 Hand-painted snowdrops on this unique English teacup. I thought it paired so nicely with snowdrops from the flower bed, I couldn't resist pairing them for a photo. As spring bursts into bloom, flowers with much more showy vibrancy are appearing, but they do not take take anything away from the beauty of these little gems. The teacup is gorgeous! I love snowdrops. I wish I had some in my garden. I am only aware of snowdrops via blogs. This tea cup is delightful and a lovely shade of green...never have seen one like it before. Yes, a scrumptious pairing! Such a pretty teacup. The first flowers of spring are so delightful after a long winter. Spring is just starting here in southern Ontario so I'm looking forward to some colours emerging as well as the warmer days. That really is a sweet teacup. Love it paired with the snowdrops. Truly lovely!! I love snowdrops too. I've never seen that design on a teacup. What a treasure! I love your teacup. So very pretty. I love snowdrops.Is spring really coming?